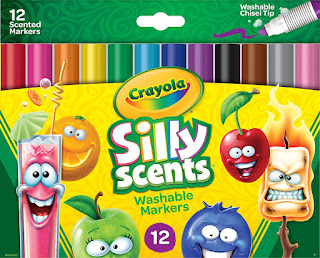 Head over to get this set of Crayola Silly Scents 12 Ct Washable Scented Markers for ONLY $4.79 (Retail $7.99)! With Crayola Silly Scents Chisel Tip Scented Washable Markers, kids can create artwork that looks vibrant and smells amazing. Great for ages three and up, the markers feature fun scents including Cherry, Orange, Green Apple, Grape, Blueberry, Lemon, Fresh Air, Fruit Punch, Coconut, Cotton Candy, Marshmallow, and Root Beer. Stimulate young artists' senses and watch their imaginations come to life with Crayola Silly Scents washable markers.